Whenever machine work is performed on a crankshaft’s journals, these surfaces must be adequately finished before use in an engine. Besides maintaining a sufficient microfinish, it is also important that any burrs are removed. A critical area where burrs are often found are just inside of the journal’s oil passages. The way to remove these burrs is by using a process known as chamfering. Burrs develop on oil passages from a variety of machining operations. Just grinding the crankshaft .010” can leave a small burr that would restrict the proper flow of oil while the engine is running. This poses a serious concern since engine bearings need to be adequately lubricated at all times. Chamfering is the industry standard in deburring crankshaft oil passages, which is explained in more detail below. If you look to the image to your right, you will see what the oil passages look like when they have been lightly chamfered. This deburring process was completed with a die grinder, small grinding stone and an automotive machinist’s steady hands. The die grinder rotates the stone at a high RPM and the machinist gently follows the outside of the existing passageway with the stone to make a light cut, while also being careful to deburr the entire circumference around the oil passage outlet. Generally speaking, chamfering is performed as part of the crankshaft polishing process and must be performed after most significant crankshaft repairs have been made. 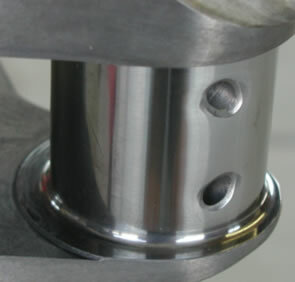 Just before the crankshaft is polished, it is chamfered in the grinding machine. Because chamfering can also create slight burrs, a polishing belt is all that is needed to remove any burrs left behind from the surface where the stone has met the journal’s outside diameter. When a crankshaft is welded, it almost always needs to be chamfered. Instead of simply cleaning up the outside of the oil passage after a welded journal has been roughed in, the automotive machinist will often use a long and narrow stone to cleanup the inside of the passageway as well. Because welding penetrates existing steel, a small amount of weld may enter the passageway that is easy cleaned out with the right stone and chamfering process. When a journal has been welded, some automotive machine shops prefer to instead drill out the oil passage using a special carbide chamfering drill bit. Although this type of chamfering may be needed when an excessive amount of weld has blocked the interior oil passageway, the finish it leaves behind is often less than desirable. Many automotive machinists that must use a chamfering drill bit to clear out an oil passageway will then smooth out the passage with a die grinder and fine stone. There are some automotive machinist that will not only chamfer the circumference of the outer oil passage hole, but they will add a directional cut with the die grinder’s stone that leads into the journal. The theory behind this is that such an elongated chamfer will aid in the distribution of oil, especially on high performance engines. While this may be true while the engine is running, on initial startup of the engine it will take longer for the oil to completely surround the void between the engine bearings and journals. For this reason, most automotive machinists opt to perform a light chamfering process that does not elongate or extend the size of the oil passages. Now that you learned more about chamfering a crankshaft’s oil passages, please consider rating this page below. This entry was posted in Polishing on August 26, 2013 by admin.